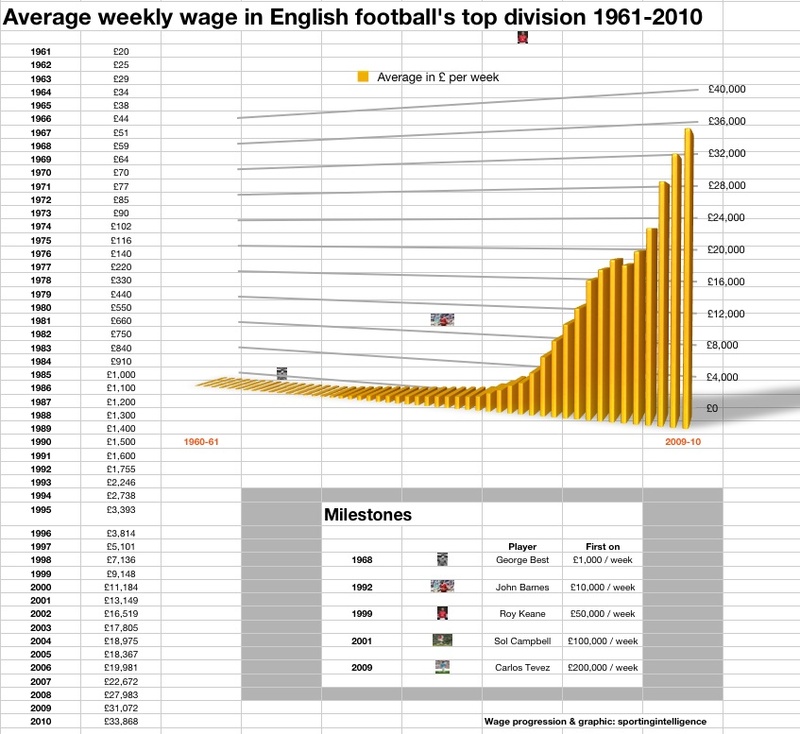 The average footballer’s wage in England’s top division has climbed from £20 per week in 1961 to £33,868 per week or thereabouts 50 years later. This week marks half a century since the abolition of the maximum wage in English football, as has been noted by a variety of media coverage, including the piece linked here, written by my Mail on Sunday colleague Joe Bernstein, published earlier this month. Footballers’ wages have grown massively over time, and this is shown below, season by season, in a table researched using a variety of sources, not least Professional Footballers’ Association documents and records. The numbers are most reliable for the past 20 years because we have detailed information about individual clubs’ wage bills in the Premier League. Using analysis honed over many years of close study of footballers’ pay, we can demonstrate quite precisely how average top-flight earnings have changed. Before 1992, a series of landmark figures were used as a basis to estimate averages as accurately as possible; inevitably there has been some ‘filling in’ in between those landmarks. Nonetheless, the numbers and the progression are as close as we can come to showing how pay has changed. Indisputable is how much pay has rocketed since the formation of the Premier League – with its TV riches from 1992-93 onwards. When Kevin Keegan joined Liverpool from Scunthorpe in May 1971, Bill Shankly’s first wage offer was £45 per week. In his 1977 autobiography, Keegan recalled: ‘I wanted to sign there and then but remembered that my father had told me not to sell myself cheap.’ Keegan told Shankly he expected more than £45. Shankly replied: ‘That’s upsetting. Don’t forget, young man, we’re paying £33,000 for you.’ Keegan’s basic wage at Scunthorpe, in the old Fourth Division, had been £30 a week, with £8 win bonus and £4 draw bonus. Keegan and Shankly eventually settled on a starting wage of £50 a week at Liverpool. Regular first-team football, appearance money and win bonuses added £80 a week to that basic figure, for £130 a week for one of England’s best players at one of its biggest clubs. The sustained dominance of English clubs at Europe’s top level between 1977 and 1982, with the European Cup being won successively by Liverpool, Liverpool, Forest, Forest, Liverpool and Villa, also helped to boost English football finances. Trevor Francis became England’s first £1m transfer in the 1978-79 season. Figures cited in the official history of the PFA show that only eight players in England earned basic salaries of £50,000 per year in 1980-81, but this rose to 41 players by 1984-85 and steadily thereafter. In the early 1980s, the percentage of clubs’ incomes that was spent on wages was typically around the low 40s. By 2008-09, it was 67 per cent in the Premier League, a sign of growing player power in their ability to demand money, and get it.